June 2018 My Imagination Mail “My Fairy Tale Box PLUS” Review. Disclosure: This post contains affiliate links. I received this box for review. I get a commission from my links. My Fairy Tale Plus by Imagination Mail is the sponsor for thsi giveaway. Disclosure: This post contains affiliate links. I received this box for review. I get a commission from my links. Giveaway is sponsored by My Fairy Tale Plus by Imagination Mail. Disclosure: This post contains affiliate links. I received this box for review. Giveaway is sponsored by My Fairy Tale Plus by Imagination Mail. Disclosure: This post contains affiliate links. I received this box for review. Giveaway is sponsored by Vellabox. Valor Blocks May 2017 Army Review Disclosure: I received this box for review. Disclosure: This post contains affiliate links. Dog's Best Trend sponsored this giveaway and sent this box for review. Disclosure: This post contains affiliate links. I received this box for review. 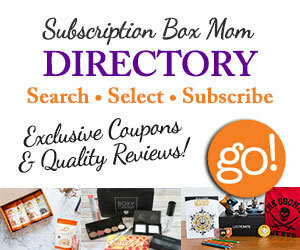 Giveaway is sponsored by Subscription Box Mom.